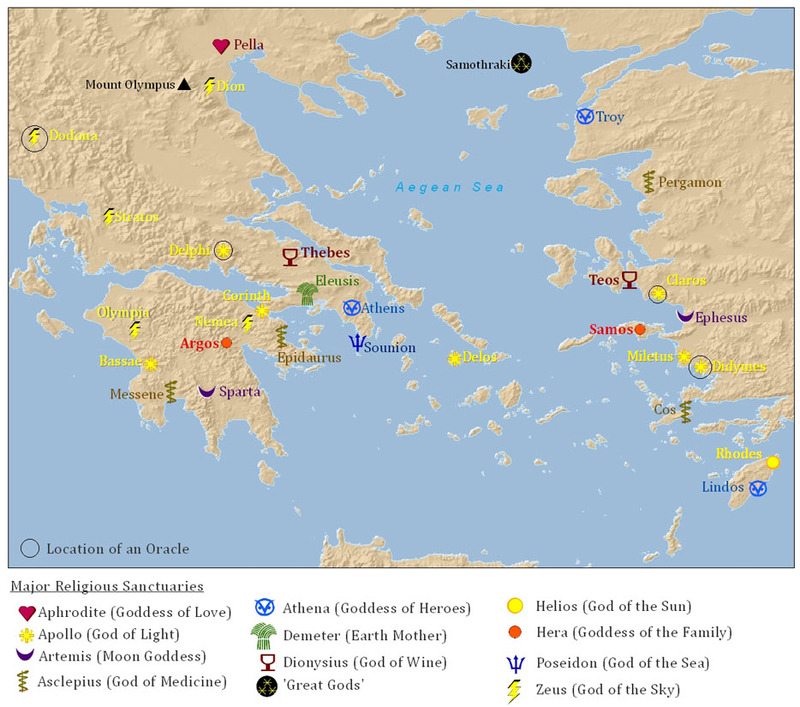 Ancient Greek religion was polytheistic, meaning that there were many gods and goddesses. There was a hierarchy of deities, with Zeus, the king of the gods, having a level of control over all the others. Each deity generally had dominion over a certain aspect of nature, for instance, Poseidon ruled over the sea and Artemis ruled over the Moon. Other deities ruled over an abstract concept, for instance Aphrodite was the goddess of Love. Some gods were also specifically associated with a certain city. For instance, Athena was associated with the city of Athens, Apollo with Delphi and Delos, Zeus with Olympia, and Artemis with Ephesus. Whilst being immortal, the gods were not all powerful. They had to obey fate, which overrided all. For instance, in mythology, it was Odysseus' fate to return home to Ithaca after the Trojan War, and the gods could only lengthen his journey and make it harder for him, but they could not stop him. The most powerful gods were known as the Olympians, of which there were twelve. They were believed to reside at the top of Mount Olympus. The twelve deities were Zeus, god of thunder and the sky, Hera, goddess of the family, Poseiden, god of the sea, Demeter, goddess of the Earth and harvests, Ares, god of War, Hermes, god of commerce, Hephaestus, god of metalcraft, Aphrodite, goddess of love, Athena, goddess of heroes, Artemis, goddess of the Moon, Hestia, goddess of the home, and Apollo, god of light. Though there were also many other important 'lesser' dieties, such as Dionysis, the god of wine, and Asclepius, the god of medicine. Towards the end of the Classical Age and during the Hellenistic Age, a number of Greek philosophers began to question the traditional mythologies of their ancestors and offer alternative hypotheses to the origin of the universe. Aristotle (384 BC – 322 BC) postulated the existence of a single supreme being loosely referred to in his book Metaphysics as the "Prime Mover" or the "Unmoved Mover", though whether he intended to mean that the "Prime Mover" was really a conscious being or simply a force of nature is open to interpretation.